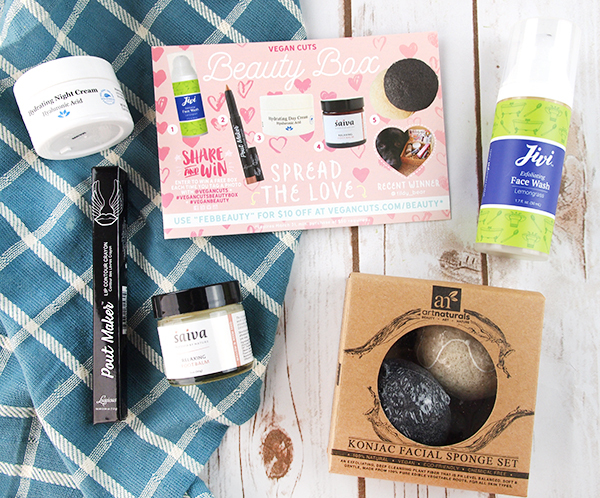 You will have a Lot of Love for The February Vegan Cuts Vegan Beauty Box! February tends to be dark and cold. Even though I do enjoy winter, I find myself counting down the days until spring arrives by mid-February. 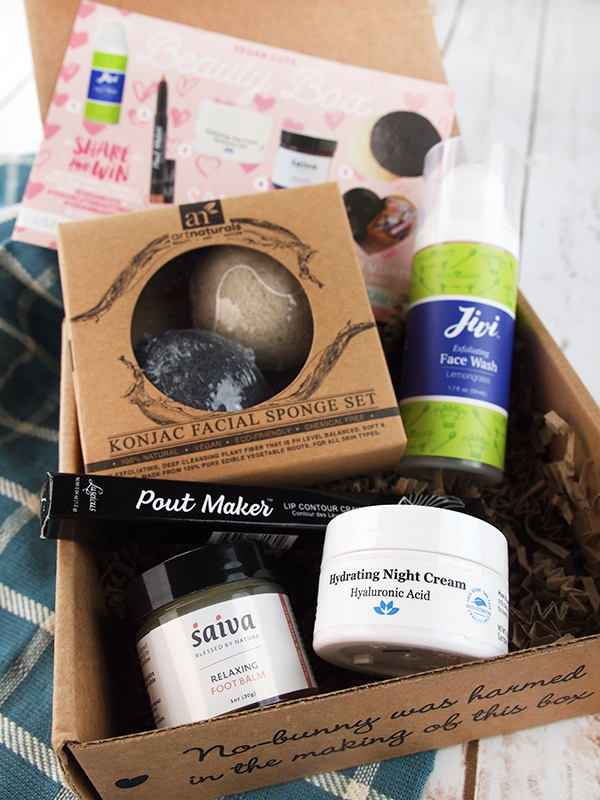 The arrival of this month’s Vegan Cuts Vegan Beauty Box has been a bright spot in a dreary month, though! 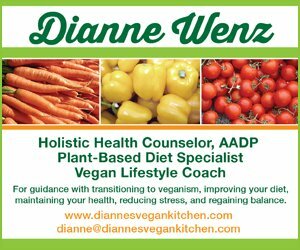 If you’ve been vegan for a while you have probably heard of the Vegan Cuts Vegan Beauty Box, but if you’re a newbie, you might not know about it. 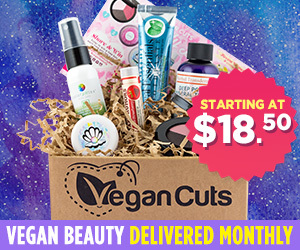 The Vegan Cuts Vegan Beauty Box is a box of cruelty-free beauty products that gets delivered right to your door every month. Each box contains 4-7 products skincare products, hair care products, and cosmetics. The products are usually sample sized, but there are times when you’ll receive full-sized products too (as was the case with this month’s Art Naturals Konjac Facial Scrub Set and Luscious Cosmetics Pout Maker Lip Contour Crayon). The Vegan Cuts Vegan Beauty Box is fantastic for discovering new brands and sample products without spending a lot of money. It’s also perfect for new vegans who are just learning about cruelty-free brands. 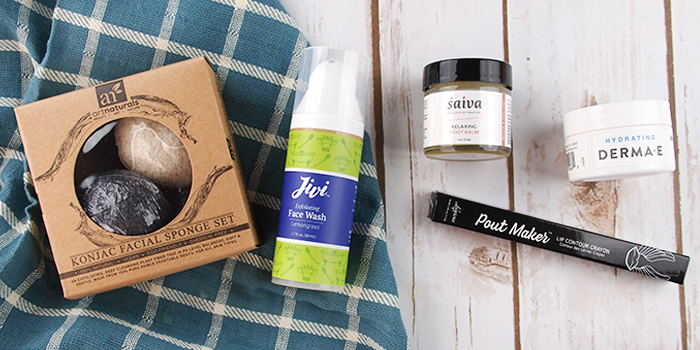 The February Vegan Beauty Box was full of products to pamper and protect winter skin, and I loved it! Art Naturals Konjac Facial Sponge Set – With this handy sponge duo, you don’t need to worry about facial cleansers, because konjac fiber is deeply cleansing on its own. 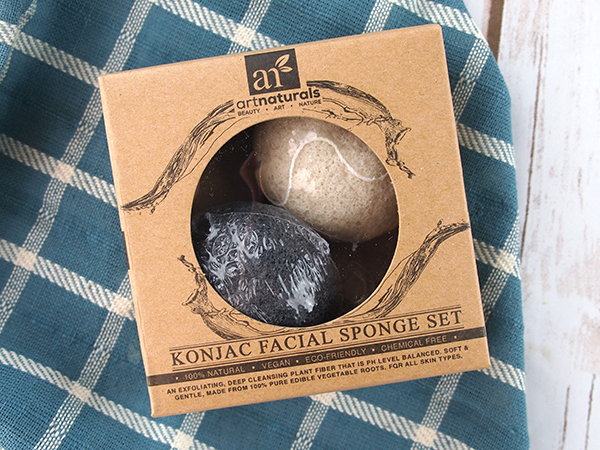 Konjac fiber also helps to balance the skin’s pH levels while gently exfoliating. The white sponge is for every day cleansing, while the black sponge contains charcoal for weekly deep cleansing. My skin has felt smoother and more refreshed since I started using these nifty little sponges. The box even comes with a suction cup hook to make it easier to hang the sponges between uses. Jivi Exfoliating Face Wash – This gentle exfoliating cleanser is formulated with such natural ingredients as aloe vera juice, grape seed oil, pineapple, and papaya. It also contains chickpea flour and Fuller’s earth to help pull toxins from the skin. I hadn’t heard of Fuller’s earth before, so I looked it up, and it’s known for it’s ability to absorb oil, dirt, and other impurities. That sounds great to me! My face has felt softer and fresher since I started using it. 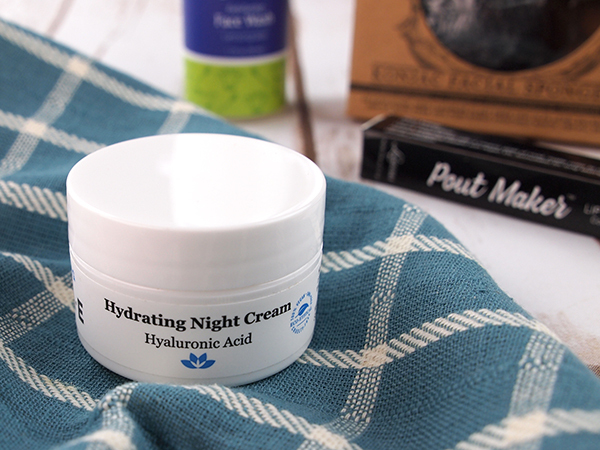 Derma E Hydrating Night Cream – Thanks to the Vegan Beauty Box, Derma E has become one of my favorite skin care brands, so I was excited to find this cream in this month’s box. I love its fresh scent! It has a luxuriously smooth and creamy feel to it, and it doesn’t leave my skin feeling greasy afterward. This cream is exactly what I need right now, as my skin gets crazy dry in the cooler months. Saiva Relaxing Foot Balm – Not only does my face get crazy dry, but my feet do, too. This healing balm is just what my tired tootsies have been needing! It contains neem oil, calendula extract, cocoa butter, and avocado extract to sooth and heal dry, cracked skin. It’s also forumulated to help reduce any swelling, pain, or irritation in the feet, too This cream is so rich it almost seems to melt right into the skin. It also contains rosemary, peppermint, and lavender oils, which give it a fresh, minty fragrance. Luscious Cosmetics Pout Maker Lip Contour Crayon – This creamy matte lip liner glides on smoothly. It’s great for contouring, or even filling in, your lips, and it stays put for hours. Thanks to argan oil, it moisturizes, too. I received the color “Perky,” which is a gorgeous dusty rose color that suits my skin tone perfectly. 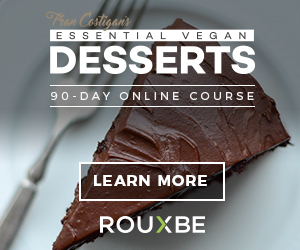 The Vegan Beauty Box is available as a monthly subscription from Vegan Cut. 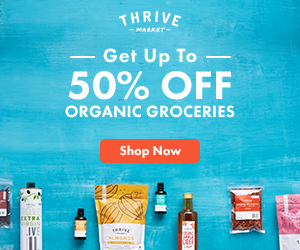 Once you sign up, a box of new goodies gets delivered to your door every month.